The alliance of humans and renegade Fhrey is fragile—and about to be tested as never before. Persephone keeps the hum Rich in magic and adventure, Michael J. Sullivan’s soaring fantasy novels are masterworks of heroism, love, and sacrifice. Now, in Age of War, the epic battle between humankind and the cruel godlike beings who once ruled them finally ignites in all its fury. To ask other readers questions about Age of War, please sign up. Is the Amazon cover and release date (Feb 20, 2018) final? If so, that cover is amazing! When does the audio version comes out? If you follow me here on Goodreads, you know that I don't rate my books. I do, however, use the review feature to update people on the process of books. So here goes. Update 08/23/18 - We made the list! What list you ask? 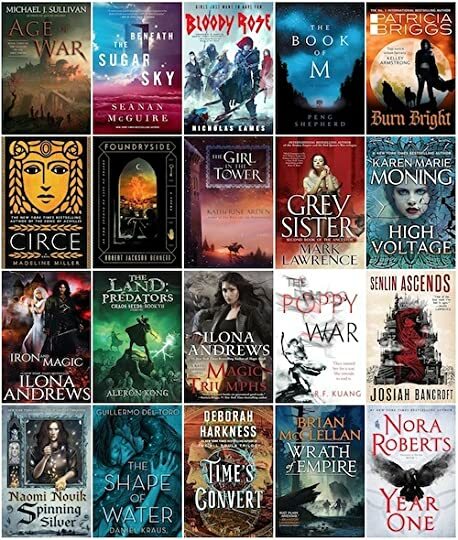 Why the Goodread's Best Fantasy of 2018 (so far list), of course. Here's all the books that are includ If you follow me here on Goodreads, you know that I don't rate my books. I do, however, use the review feature to update people on the process of books. So here goes. Update 08/20/18 - People are pretty excited for Age of Legend, ,and I'm already getting emails wanting to know (a) when it will be available for pre-ordering and (b) how can they sign up for early notification. Well, the answer to the first question can be found here, and here is a sign-up form for the second. Update 08/05/18 - One month plus release and things continue to go well, we've sold more than 44,000 books (20% ebooks | 22% hardcovers | 58% audiobooks). It looks like a lot of you are listening to the books. 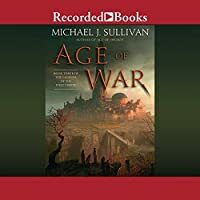 So much, in fact, that Age of War hit the New York Times Bestseller list for the month of July for audiobooks. How are you consuming the book? Update 07/11/18 - One week plus since release and things are going well. The book topped out at a sales rank of 373 - on Amazon - which I'm very pleased with, and the reviews have been very positive 97% of people on Goodreads "liked it" and it's running at a solid 4.5 overall ranking. Oh, and it's now available for direct purchase for people who want signed copies. Update 07/02/18 - Age of War releases tomorrow!! And Age of Myth is on sale right now from Audible (just $5.95) so good timing on that. All three books are hitting the Epic Fantasy Bestseller's list so thank you for your continued support. 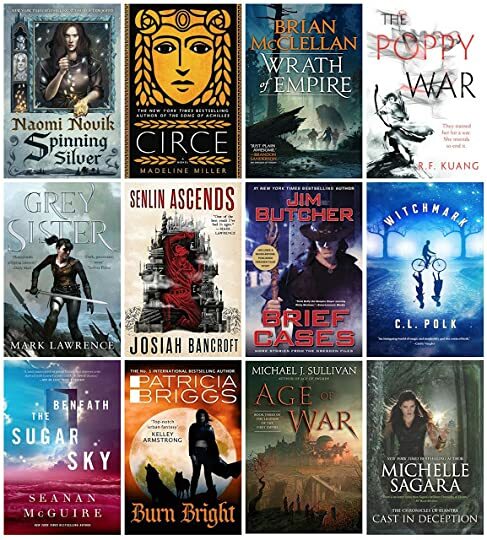 Update 05/21/18 - Age of War was picked as one of Goodread's Hottest Books of the Summer! Update 05/01/18 - Another ARC Giveaway has been posted. Here is the link. These are my last two copies fo the ARC, and I'm not sure if Del Rey is running another Giveaway before release date, so this may be the last one. Good luck on the drawing! Oh, and it ends at the end of the month so winners will get the book about a month before release. Update 03/29/18 - There is a few days left in a Goodreads Giveaway for ARC (Advanced Reading Copies) of Age of War. It's open only to residents of the US, but there is a parallel Giveaway open to people of all countries for members of my Private Goodread's Group, The Dark Room. If you would like to join here is a link. Update: 02/09/18 - There's some good news and bad news. The printer's proofs for Age of War will be arriving on 2/13/18 just a few more days! That's the good news. The bad news is the book will be delayed a couple of months. The new release date is July 03. Don't blame Del Rey, it's 100% my fault. You see, when Robin and I did my final read through on the copy edits, there were some issues that we felt should be addressed. As such, we were late hitting our copy edit review deadline, and Del Rey had to copyedit the new stuff. All this meant slippage in the release. I could have ignored the issues and hit my release dates, but I opted for quality over speed. I hope you'll be understanding. In the grand scheme of things 75 days is nothing when stacked up against other writers like Rothfuss, Martin, and Lynch. But then again, I guess I shouldn't be putting myself in that same company. Still, I hope you'll be patient with us and understanding ofthe choices we made. Update: 01/08/18 - Home stretch! Robin and I did our final pass through the copyedits of the book. I deemed it "good to go" - Robin pointed out a few minor tweaks - and they really are minor so I'm implementing them today and iI'm guessing it'll be to Del Rey in the morning - then it's off to the presses! Update: 10/02/17 - And....DONE! Just finished implementing all the beta feedback. They did a terrific job! Going to give it one last read through then send it off to Del Rey's production team for copy editing, layout, and the other production task. I'm thrilled with how it came out. Update: 09/28/17- Received the compilation of all the beta feedback from Robin today, and I've started to make changes. Great feedback, and while there is a lot of good stuff for me to "tweak" the book won't be changing dramatically from what went to the beta team. At this point, everything is moving on schedule. Update: 09/08/17 - Received the "marketing copy for the book" from my editor, may still need some further tweaking and refinement but it's much improved from the fairly lame version I released. If you want to see what they came up with, the description has already been updated here on Goodreads. Update: 07/07/17 - Got the editorial feedback from my editors at Del Rey. One of them, claims it's her favorite book of the series to date and neither of them had any significant changes called out. I only briefly scanned the file, but I think the book is in good shape and won't need much more from me. Robin is going to do another re-read (I already incorporated her content changes), and then it will be on to beta reading! Update: 04/03/17 - Had a meeting with Del Rey last week in New York and we've set the official release date for this book to be April 2018. Which means I need to have my submitted for acceptance book to my editor in June 2017 - that should be doable. I'm going to finish up writing The Disappearance of Winter's Daughter: Riyria Chronicle #4 first (it has a release date of December 1). Robin has already provided me with feedback issues she wants addressed and they are minor and easy to incorporate. So I see no problem meeting this deadline. I have read all kinds of fantasy - urban, epic, YA, romance, you name it - and lots of it. This series has risen through the ranks of my favorites insanely fast. Age of Myth immediately ranked within my top ten. Age of Swords bumped the series up into my top five. Now... well. My top three are starting to fear for their place. I've never seen a fantasy ensemble cast rendered as beautifully as in this series. Even though each character is given only a small space per book, they all have complex mo I have read all kinds of fantasy - urban, epic, YA, romance, you name it - and lots of it. This series has risen through the ranks of my favorites insanely fast. Age of Myth immediately ranked within my top ten. Age of Swords bumped the series up into my top five. Now... well. My top three are starting to fear for their place. I've never seen a fantasy ensemble cast rendered as beautifully as in this series. Even though each character is given only a small space per book, they all have complex motives and emotions. Characters usually develop with each other and with the progression of the war, which makes the story flow well. At any point during the series, it's easy to understand and connect with each of them. Take, for example, Persephone and Raithe. While they began the series in Age of Myth as major characters with lots of narrating time, their chapters have dwindled as other characters take on bigger roles. However, Persephone & Raithe's story has lost none of its emotional power. Their relationship is more complicated than ever at the start of AoW, with Raithe determined to spend time with his keenig while Persephone fights her personal feelings to gain political clout. In just a handful of scenes across the book, MJS has created a poignant story surrounding these two idiots characters. Along the same lines, the fantasy world continues to expand in AoW, with more mysteries springing up with every question answered. While reading I was always wondering about the true nature of the Art, certain characters' questionable motives (looking at you, Malcolm & Nyphron), and what the hell is behind that damn door in Elfland. At no point could I sit back and claim that I knew where the author would take us next. In this respect Age of War stood out from the preceding two books; I really truly was not expecting the shift in direction the story seemed to take in later chapters. The author has shown that he's not afraid to lead his characters, and his plot, down a darker path. I have to mention how wonderfully clear it is that MJS planned, wrote, and edited this series in its entirety before beginning to publish book one. As the huge ensemble cast moves closer together and their paths intertwine, every step feels perfectly placed to inch the story closer to its ultimate goal. Reading the series feels like listening to a story whose teller has told it so often that he knows every syllable by heart. It's a fantastic experience. I received an advanced reading copy from the author in exchange for an honest review. Thank you, Michael J Sullivan, for this opportunity. Before I start, let us take a moment to admire the stunning cover for Age of War by the one and only, Marc Simonetti. In my opinion, this is the best co I received an advanced reading copy from the author in exchange for an honest review. Thank you, Michael J Sullivan, for this opportunity. Regardless, the narrative did not go all-out at a breakneck pace as true to Sullivan's approach to storytelling character development always takes precedence. While the preceding volumes, especially Age of Swords, tend to favour the women (which are some of the best female characters in fantasy), we have pretty much equal opportunity for all main characters to shine in this latest instalment. It includes one notable introduction from the previous book, a young man whose name alone caused a whole lot of flailing (on my part at least) because of its implications. Sullivan also has a penchant for unlikely heroes, which makes his stories so compelling. Think of Myron and Emilia from Riyria, and in this series, Gifford and Roan. My favourite part of the whole story so far is the getting the real juice behind the legendary tale of Nyphron and Persephone. In this respect, I always believe that it is fascinating to read the Legend series after Riyria even though one does not truly spoil the other. Now, though the revelations are the main draw for me, I wouldn't be half as engaged in the story if I do not care about the characters. Sullivan's biggest strength as far as I am concerned has always been his characterisation, which I will extend to some with dubious personalities and even that whiny brat, Mawyndule. The tears are still in my eyes when I think of this book. Dang you Michael J. Sullivan, dang you. Age of War encompasses all the emotions one would feel during a war. Not everyone makes it through battles and some sacrifices are as beautiful as they are heartbreaking. This is a wonderful continuation to the story. It shows how incredibly invested I am in the characters, that even though I finished this weeks ago, every time I think about it I’m taken back to the emotional moments, good and bad. and feel all the feels all over again. First, I think the important thing to remember is it is not the end of the Legends of the First Empire series. There are some very big moments and it is an end to one of the major ARCs for the first battles of the war between the Fey and humans. But it is not the end of the line for many of the characters that made it to the end. Suri is by far one of my favorite characters of the series and she has come a long way from the mystic child she was in Age of Myth. After the sacrifices made in Age of Swords, she is a little bit harder and she has lost some of the innocence she used to carry with her. But as a character in this series, she is still my favorite. Her journey is a harder one as she will be the one that needs to carry on after friends have been lost to her. Suri was surrounded by people, yet not a part of them. She was the daisy among the daffodils, the fly in the goat’s milk, the butterfly in the army. There are a few romantic couplings and none of them have a conventional or easy time of it. Roan and Gifford is my favorite pairing. They are both broken in some way. Roan is broken on the inside, after years of being a slave and Gifford is broken on the outside, but the most patient and kind man in the story. I love the friendship and more that is between them even if Roan isn’t sure how to express it at times. I really liked how Gifford played into the prophecy from when he was born. It was very well executed. Persephone and Raithe. Well if like me, you have already read the Riyara series, you know who Persephone is supposed to end up with. I was really hoping for a twist to the story that showed how the legends got it wrong. These two put me through the ringer and while I won’t say how it worked out, I will say I’m still emotional weeks later while writing this. Accept that you’re going to get hurt, that you’re going to die; embrace it, and you’ll find the freedom to live. This was one of the many ridiculous things his father had told him that sounded less stupid every day. Tesh…I love that kid and it seems he has found another to love as well. Tesh was the biggest surprise for me in this book. Again I know his legend from the Riyara series but to see how the legends got started was amazing. I also enjoyed the little crush happening between him and a certain scribe. “Great. The kid’s going to be impossible to live with now,” Raithe grumbled. As for Malcolm, Nephron and the others, well their stories are all interesting and complex too. I will say I haven’t decided if any of them are good or bad but the twist surrounding Nyphron was huge to me and I’m still trying to get my mind around the implications of it. I also am still uncertain about that mischievous Malcom. It was interesting delve into his origins and get some of his story but even after that, I still have no idea if he is on team good or team bad or a team I don’t even know about. 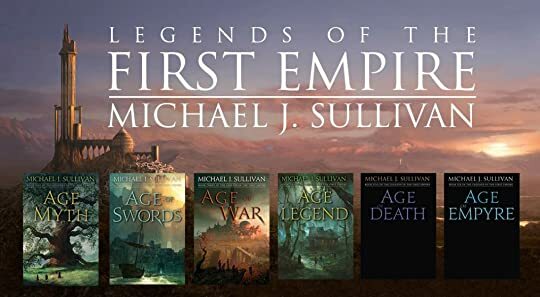 All the resentments, cruelties, conspiracies and ambitions that have been simmering since Age of Myth (and even before) boil over and explode in Age of War, the third book in Michael J. Sullivan‘s LEGENDS OF THE FIRST EMPIRE series, a prequel series to both his RIYRIA CHRONICLES and RIYRIA REVELATIONS series. *Some spoilers for the first two books in this series follow* The Rhune (humans), finally unified (more or less) under the leadership of Persephone, and prompted by the designs of a small group of military Fhrey (elves), the Instarya, who have rebelled against their society’s leadership, move to take over the fortress of Alon Rhist, an outpost of the Fhrey in Rhune territory. The Instarya leader, Nyphron, is successful in his plan for a surprisingly bloodless takeover of Alon Rhist, but not everyone in Alon Rhist approves of the change in control. Lothian, the fane or leader of the Fhrey empire, has finally had enough of these pesky Rhune, not to mention the Instarya renegades, and begins gathering and training his legions to attack and retake Alon Rhist and exterminate the troublesome Rhune. The Fhrey armies move toward what they think will be a quick war and victory; after all, they’ve always had a monopoly on magical power, not to mention the secret of making bronze weapons while humans were still muddling along with stone and ― if they were lucky ― copper. But humans have a vast advantage in numbers over the Fhrey, plus a couple of powerful magical workers of their own. Moreover, in Age of Swords, humans managed to swipe from the dwarves the secret of making iron weapons, though doing so correctly is still a work in process. Roan, resident Rhune genius inventor, is hard at work trying to figure out the lost secrets of iron-working, including ways to make it even stronger. Age of War doesn’t have quite the insane pace and number of society-transforming inventions that Age of Swords did, but the rapid advance in technology that Roan instigates is still eyebrow-raising, not to mention being the source of a snort-inducing pun. With this buildup to war and the war itself as the setting, Sullivan delves into the lives of the individuals we’ve been following for the last two books. Nyphron has made a Persephone an offer of marriage to seal their alliance. Persephone sees the advantage of the deal for her people, but knows that Nyphron doesn’t really care about her on a personal level. Knowing that Raithe, a younger Rhune warrior, loves her deeply makes her choice even harder. Suri, the only human versed in the Art of magic, has an even worse choice to make. Age of War moves the overall story arc of the LEGENDS OF THE FIRST EMPIRE along well. Characters have difficult, even heart-wrenching choices to make. Long-held secrets and plans are revealed. Twists are turned. Monsters menace. And possibly the shallow Mawyndulë gets just slightly smarter? I’m dubious, though, and still wondering why Sullivan chose this maddeningly obtuse youngster to represent the main viewpoint of the Fhrey. I’m not fond of Mawyndulë, especially after three books of his idiocy, but I’ll grant that he does offer a unique and unusual point of view. After focusing primarily on female characters and viewpoints in the first two books of this series, Mawyndulë being one of the few exceptions, a few additional male point-of-view characters are added. The most significant of these is Tesh, an orphaned teen who is the most driven of all the Rhune in learning the art of sword-fighting. Tesh is so intense that Nyphron and his best fighter, Sebek, begin to be alarmed at what might be motivating his single-minded training. Tesh does take some time off from training to cautiously pursue a relationship with the scribe Brin. But the romance is a small side note to the war-planning and conflicts. Despite the action, Age of War didn’t engage me quite as much as the prior books in this series did. The pace lags somewhat during the months-long buildup to the war, and Persephone is somewhat hamstrung as a leader by her romantic dilemma, with her heart and brain at odds, and by the difficulties in leading an alliance with elves who uniformly sport a superior attitude. Despite their secrets and quandaries, characters aren’t particularly multi-faceted. Still, Age of War is a solid entry in this epic fantasy series, spinning a complex set of world-shaping events. I was picked to be one of the “gamma” readers for this book, meaning I searched it for typos after the beta readers were done. I was so thrilled to get to do this. I read it with my proofreader’s brain rather than my reader’s brain. Sometimes I had to go back and start a part over because I accidentally got lost in the story instead of carefully looking at all the letters. I think this is my favorite of the series so far. Like another reviewer mentioned, the first half is like slowly riding to the top of a roller coaster. You don’t even realize that’s what’s happening until all this action starts happening. Besides battle scenes, there are surprises and mysteries and heartbreak and plenty of character development. The second half is so suspenseful and gripping. I think there are some big things in store for the series. The previous book had a quest that left a lot of characters behind, but here they all get fairly equal “screen” time. I was given a beta-version ecopy of this book in exchange for honest, thorough feedback. Note that this is not the final version of the novel and might change significantly before it is published. But like I said with the beta reads of the first two books in this series, it shouldn't change that much. This baby is awesome as it is and will only need small tweaks and edits to put it in the same ballpark as the other books. Legends of the First Empire fans will not be disappointed. If you loved Age I was given a beta-version ecopy of this book in exchange for honest, thorough feedback. Note that this is not the final version of the novel and might change significantly before it is published. Legends of the First Empire fans will not be disappointed. If you loved Age of Myth & Age of Swords, you will slap this one right up there on your favorites shelf beside them. The Fane and the Fhrey loyal to him intend to wipe out Nyphron, his followers, and all of humanity. Nyphron is preparing to use humanity to overthrow the Fane and take over the Fhrey. In order to do that Nyphron needs the keenig Persephone and he proposes marriage to her in order to gain control over humanity through her. Persephone, despite her feelings, seriously considers the proposal to protect her people from the wrath of the Fane. The Age of War is upon them all and sacrifices must be made The Fane and the Fhrey loyal to him intend to wipe out Nyphron, his followers, and all of humanity. Nyphron is preparing to use humanity to overthrow the Fane and take over the Fhrey. In order to do that Nyphron needs the keenig Persephone and he proposes marriage to her in order to gain control over humanity through her. Persephone, despite her feelings, seriously considers the proposal to protect her people from the wrath of the Fane. The Age of War is upon them all and sacrifices must be made in order to survive. This particular novel combines friendly immortals with the struggling humes and a full ramp-up of the war including stronger magics, stonger weapons, and runic ar Legends of the First Empire, and specifically this book, is a solid epic fantasy fare. The focus is on characters, mostly, with the original two races in headlocks against each other. Pretty standard fare, really. Long-lived elfish versus the ignorant humes, add new technology of war after knocking the scales off the eyes and mix well. Perfection. Simply amazing. It’s the best in this series and I enjoyed it to the max. I can say wholeheartedly that for me is on par with Heir of Novron, only with an added incentive: it doesn’t end the series; we still have three more forthcoming and they can’t be here soon enough. If in the previous parts I had a problem with the characters, it vanished now completely. Their development is complete and they fit into the story perfectly. It’s so marvelous to see, for example, how Suri is transfo Perfection. Simply amazing. It’s the best in this series and I enjoyed it to the max. I can say wholeheartedly that for me is on par with Heir of Novron, only with an added incentive: it doesn’t end the series; we still have three more forthcoming and they can’t be here soon enough. And it was such an emotional rollercoaster in the end; you might want to have a box of tissues close at hand, you’ll need it. So, I laughed and I cried and I savoured every word; still, it ended way too soon… I can’t wait for the next. Note: I listened to this on audio so spellings may not be correct! Continuing the theme of really fun books in this series, I have to say I am not surprised that once again Sullivan has written a book I really liked. This is the third in the series, so I would recommend reading my first two reviews to find out more about the world and magic, but the shortened version is that this is the same setting as Hadrian and Royce's Riyria, but thousands of years earlier when the world is just beginning and Note: I listened to this on audio so spellings may not be correct! Continuing the theme of really fun books in this series, I have to say I am not surprised that once again Sullivan has written a book I really liked. This is the third in the series, so I would recommend reading my first two reviews to find out more about the world and magic, but the shortened version is that this is the same setting as Hadrian and Royce's Riyria, but thousands of years earlier when the world is just beginning and the people of it are slowly starting to make history. This story follows many of my favourite characters again: Raithe, Brin, Persephone, Sari and more, but it also brings in some newer ones like Tesh. I really liked Tesh's more prominent focus in this book, and as this book is the start of the real war between two great peoples, I think that the focus made sense too as he is a warrior. Honestly, there's not too much I can say about this one at this point in the series, besides that it's great and you should read it, but I am really enjoying seeing how the magic of the world is being unlocked through new discoveries about the Art. I also really like that although this whole book is pretty much focused on a War and getting ready for a War, Sullivan still managed to keep me interested and make me really want to see where things would go. There's also some pretty big twists to the fighting of the War which made it a lot of fun! This one started out really slowly to the point where I thought it was going to be a book 2 repeat. MJS is great at character development but sometimes he gets too fixated on the microscopic details of the characters and forgets there's a story to tell. This being book 3 and given how much character building we saw the first two book coupled with this book's name I was waiting for an explosion not a tea party. The second half of the book we finally got it and not at the expense of more thorough character building. There were also a lot of long game elements that showed their reveals or possible outcomes into the Riyria generation. It took me a day to finish this highly anticipated new installment in a series that became one of my favourites from the first book. Although a fantasy addict, I am also a connoisseur with high demands and standards; world-building, characters, plot-twists, and a plethora of other essential parts making up an excellent book. And, Michael J. Sullivan keeps providing all of it, not shying away from exhibiting one of the most crucial trait of a wonderful writer - playing their readers' emotions lik It took me a day to finish this highly anticipated new installment in a series that became one of my favourites from the first book. Although a fantasy addict, I am also a connoisseur with high demands and standards; world-building, characters, plot-twists, and a plethora of other essential parts making up an excellent book. And, Michael J. Sullivan keeps providing all of it, not shying away from exhibiting one of the most crucial trait of a wonderful writer - playing their readers' emotions like a virtuoso. I would like to avoid any accidental - or not - revelations and spoilers about the book as it's been only couple of days since it seen the light of day. What I would like is to mention some of the emotions while devouring page after page. Utter disbelief - because, let us be quite honest, I did NOT see some of what was coming. I mean, really. Trepidation - what would the next page bring, the next chapter, and gods forbid, was I nearing the end of the book? Would it leave me... shattered and with questions? Well, of course it did. Snotty nose and red-rimmed eyes - allergies. NOT crying. NO. The last book to make me weep was John Gwynne's 'Wrath'. And I am definitely not a Johnny-come-lately to the world of epic fantasy to believe with the purity and naivité of ignorance that everything ends well. Ergo, my shriveled, black, antagonistic heart is usually incapable of such incongruous things as crying. Alas, Michael J. Sullivan's sustenance is the nectar derived from the tears of his readers. Incredulity - at the author's skill and lack of fear at having a fluid cast of primary characters. Some, who started out in the limelight of the first book, now found themselves in supporting roles; their stories somehow woven into the background of the story's tapestry, yet the rich, vibrant colours of their arc's still essential in the overall composition of the book. There was a myriad of other emotions. Some short-lived - like a smile at a witty banter, or a recognition of particularly lyrical description - while others lasted longer, adding to the general exhaustion and hangover after finishing a GOOD book. That's it, really. I also still might be a tad dazed and such. Probably. Well this certainly was (mostly) depressing and heartbreaking. And incredibly entertaining. For me this was easily the best book in this series, so far. I'm sort of glad that the next book is months away. In the meantime I'll try to prepare for the, most likely, unavoidable and upcoming heartbreak. You can be very cruel sometimes, Michael. I love it. This one was SOOO GOOOOOD! Lots of action, just the stuff I like. Crazy stuff happened. 2 of my favourite characters died. MICHEAL J SULLIVAN IS A MURDERER 😭. There are just too many feels going on right now for me to properly review this book. So much happened, and yet it felt like the book wasn't long enough. MJS punched me right in the gut, AGAIN! I had tears by page six, that's how you know the author is good! Age of War had a slow buildup to the action, which starts around Chapter fifteen and just keeps building from there all the way to the end. Characters are MJS's strongest part of any book he writes. It was so glorious and heart wrenching all at the same time to be back with these characters as they fight for their very survival. I absolutely love the Book of Brin quotes at the beginning of each chapter. They're kind of a little hint of what's to come and warn you when the unspeakable is about to happen so you can prepare yourself. Age of War is the third book of The Legends of the First Empire series and it is aptly titled, given how things are heating up again after the slight slowdown we experienced in the previous installment. From my time with the Riyria Revelations, I’ve learned that Michael J. Sullivan is an author who likes to slowly and methodically build up a series arc, and though this strategy often leads to uneven pacing and some monotony during the early volumes, it’s absolutely worth it to stick around because you always know the ending will be rewarding. Indeed, here we are seeing the results of the first seeds sown in Age of Myth and Age of Swords, and these burgeoning developments are growing into a very promising outlook for the rest of the series. So far, we’ve seen the results of the brutal clashes between humans and Fhrey, but also learned that the relationship between the two races aren’t all that simple. The Fhrey have their own internal conflicts, with infighting and rebellions against the Fane. The leader of one of these fractured groups is Nyphron, who has taken his renegades and joined forces with the humans, led by Persephone. But with so much history of anger and distrust between their two peoples, this new alliance is proving fragile. In response, Nyphron proposes marriage to Persephone in a political move to unite their two forces. Although Persephone believes it is a prudent plan, a few concerns make her hesitate. She doesn’t exactly know how to feel about Nyphron, for one, even if she knows love will not play a part in the marriage. That’s because she’s already in love with Raithe, the hero known as the God Killer. Also, while a political marriage will help solidify the alliance and help both their sides, there are suspicions that Nyphron might not have been entirely forthcoming with his agenda. But in order for her people to survive, Persephone must quickly make a choice, for the Fane’s armies are on the move and the first real war between Rhune and Fhrey is about to begin. Again, for most of the book, we have significant sections devoted to relationship building, as well as establishing the foundation for the major battle to occur at the end of the story. Persephone’s role as keenig of the human clans has her running around smoothing over conflicts and attending to everyone’s needs, while Raithe pines from afar, resenting Nyphron for the amount of time the Fhrey leader gets to spend with her. Meanwhile, Bryn is hard at work on her project, a written account of the history of the world, though she also manages to find enough time to pursue her own romance with Tesh. The young Dureyan survivor has grown from a scrawny boy to a fierce warrior, even earning himself the name “Techylor” from the Fhrey, which means “swift of hand” (but for those who’ve followed Riyria, it also means so much more). 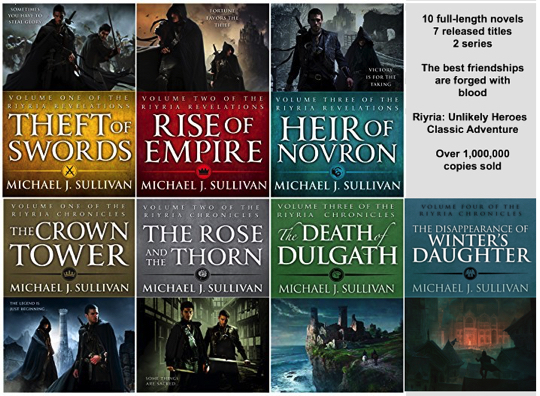 These are just a few examples of why I think readers of Sullivan’s first series will get a get a much greater kick out of these books, because they show us the truth of many of the legends surrounding this world. While it is also fine to start with The Legends of the First Empire, the stories of the characters here will probably have less impact. Most of the names here have entered into myth by the time of Hadrian and Royce, and it’s fascinating to see how much of the real history has survived and which parts have been bastardized or misinterpreted. But all in all, Age of War can be considered a pretty tame sequel up until the second half, when the plot starts ramping up towards the war. Since most of this book is a prelude to one huge battle, it does start somewhat slow, with a lot of diversions and choreographing, but once the players are all in place and the action is ready to begin, what we get is an intense drive to the finish. There were some pretty significant developments, including a couple of earth-shattering deaths, so I highly recommend preparing your emotions and bracing yourself for some painful twists before heading into this one. A review will follow when back home... Shed a little tear reading this. Cannot wait for the next installment! 5 freaking stars! But I’ve yet to give a single one of Sullivan’s books less than 5 stars, so take my eventual review with that in mind. I don’t rate many books objectively, and that goes double for any of this authors books lol. Review to come! "Dragons only kill you; Gilarabrywns break your heart." In many respects this is probably the best yet of the Legends of the First Empire series. For anyone who has read the Riyria books, this has some great little connections that make it even more enjoyable. If you haven't read Riyria yet, it won't ruin anything for you. The characters are excellent, as usual. Raithe and Suri continue to be some of my favorites, but Tesh really starts to shine here. The relationships involving these three are some of the best in the series. There are some beautifully happy and heartbreaking moments involving them that I loved. While I loved many of the characters, I felt that Persephone took several steps back in this installment. I was really disappointed with how she handled things this time around and hope that she is able to redeem herself for me in the future. An excellent and heart wrenching installment in the series that makes me want the remainder of the series immediately. If you haven't started reading these yet, don't wait, get the first one now. "Emotions had a language of their own that didn't always translate." So I just finished my ARC of Age of War. Halfway through the first chapter I had already grinned from ear to ear & got misty eyed. Before it was over I had laughed out loud several times & straight up boo-hooed twice. I was angry & hopeful & happy & heartbroken. And VERY desperate for more. The author grabs you & takes you Elan to show you that real heroes don't always look like heroes & some that look like heroes are really manipulating cowards. It takes a minute to So I just finished my ARC of Age of War. Halfway through the first chapter I had already grinned from ear to ear & got misty eyed. Before it was over I had laughed out loud several times & straight up boo-hooed twice. I was angry & hopeful & happy & heartbroken. And VERY desperate for more. The author grabs you & takes you Elan to show you that real heroes don't always look like heroes & some that look like heroes are really manipulating cowards. That was one hell of a roller-coaster of a book. We start off pretty much where we finished in Age of Swords, and basically the whole book is set in Alon Rhist. Since it's the third book I can't really go into too many plot details as it would be spoilers for the previous but all the POV's basically stay the same with an addition of one or two I think. I'm still a big fan of Persephone as she feels very realistically written. She's a bit older and definitely acts that way. Too often in fantasy b That was one hell of a roller-coaster of a book. We start off pretty much where we finished in Age of Swords, and basically the whole book is set in Alon Rhist. Since it's the third book I can't really go into too many plot details as it would be spoilers for the previous but all the POV's basically stay the same with an addition of one or two I think. I'm still a big fan of Persephone as she feels very realistically written. She's a bit older and definitely acts that way. Too often in fantasy books I think there is very little middle ground, characters are either quite young or quite old so it's nice to read about somebody in the middle, who's learned some of life's lessons and acts accordingly, she's not one to let sentiment get in the way of what needs to be done. The growth of Suri is also really well done, she has matured, even more so in this book, but man it's not been easy on her and it doesn't get better here. Raithe and Gifford both have great storylines in this book after not featuring so much in the previous and man are they emotional, both good and bad. In this third book of the Legends of the First Empire series our heroes are lamenting losses, but also preparing for war. Quite a few of them are hit with some pretty tough choices in this book. Persephone in particular did some things that I didn't like at all. I understood the reasoning behind her choice, just not the way she handled it and treated someone. This resulted in me liking her far less in this book. I was honestly disappointed in her. That being said, I can't really think of any other negatives about this book. All my favorite characters were there and each contributed greatly to the story. There were twists that I didn't see coming and heartbreaking things that happened. Chapter 28 had me crying, but as I always say, the best fantasy stories break your heart a little. Each installment of this series has had a way of tugging at my heartstrings. The characters feel so real to me, and even though some of them have special gifts, they feel like ordinary people just doing what they have to do. Those are the best sort of heroes. Thanks to NetGalley and Random House Publishing Group for providing me with a copy of this book. MJS continues to be one my favorites. He’s a true tale spinner and I just like the way the guy writes. His stories are Tolkien-esque with a mildly modern spin. He takes classic tropes that would normally turn me off from a book and somehow makes me enjoy them very much. Most of all, his stories are effectively emotional, which is hard to find in adult modern fantasy. Age of war, I will say was quite a bit slower than I expected. The title may have misled me somewhat but there really was 4.5 Stars! Age of war, I will say was quite a bit slower than I expected. The title may have misled me somewhat but there really was very little that happened (event wise) in the first half of the book. That didn’t bother me too much, especially since I’ve become accustomed to MJS’ writing style which often involves periods of more delicate plot progression and character development. But I can see how the lack of action for the first 50% of the novel would be frustrating for some. So many feelz. Need to process. Age of War is an excellent book in an already great series. It is a typical Michael J. Sullivan creation - brilliant characters, writing that touches you in your soul and a plot of epic proportions but seen from an individual perspective. There is nothing more to say. A lot of the main characters reach the end of their arc. There is tragedy and heartbreak. There is heroism and happiness. Familiar tropes are turned on their head (the ending comes to mind). If there is one criticism I have, it is Age of War is an excellent book in an already great series. It is a typical Michael J. Sullivan creation - brilliant characters, writing that touches you in your soul and a plot of epic proportions but seen from an individual perspective. There is nothing more to say. Michael gave me this copy for a "gamma" read - basically copy editing, looking for typos and grammar mistakes and such. So a big thank-you to him (and Robin) for the chance to get an early look. Hopefully I spotted some things you guys didn't. I've been a fan of Michael for a good while, and I've liked everything he's written (even if I do think Theft of Swords has some significant flaws). I've also felt that his work has gotten steadily better, with every book being an No spoilers in this review. I've been a fan of Michael for a good while, and I've liked everything he's written (even if I do think Theft of Swords has some significant flaws). I've also felt that his work has gotten steadily better, with every book being an improvement over the previously written one. I've also consistently said that he's an author that takes familiar tropes, and reminds readers of why they became so popular in the first place. And though I did (and do) mean that as an entirely sincere compliment, it is also a little bit back-handed: if his books are taking the old and refreshing them, it necessarily implies they aren't doing anything really new or ground-breaking. That's no longer the case. Age of War caught me completely by surprise, and went places I would never have guessed it would go. There were hints of this in Age of Swords, but nothing compared to this. The first half of the book was fairly slow, with a steadily building tension - not unlike a roller coaster slowly cranking its way up that initial incline. Then the second half hit, and putting the book down became a real challenge. It was not conducive to careful proofreading - I really had to work pretty hard to take my time and read carefully. Along the way Michael excited me, made me think, scared the ever-loving crap out of me, and left my heart a broken mess. I loved this book, and I hated it.